Every day we spend on average 5 to 6 hours in the saddle. Most of the nights we rest in comfortable camps, which consist of a large dinner tent and two smaller tents, set up by the team. Foam mattresses are also provided. We strongly recommend sleeping one night in the "open air". The endless starry sky will amaze you. At certain camps, it will be possible to take a hot shower. However, every night we camp near a water source. It is therefore possible to wash daily. Hotel nights induce a charge. 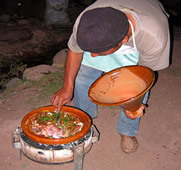 During the trek our cook prepares traditional Moroccan dishes for dinner. For lunch we serve diverse salads flavoured with local spices. Mineral water is provided, however wine, soft drinks and beer will be charged separately. Some of our camps are located near the ocean or a river so it is possible to go for a swim. The luggage is transported by a support vehicle. Due to limited room in the car we kindly ask you to take a suitcase of reasonable size. If you wish to extend your stay or arrive a few days earlier, we can book a hotel room and a rental car for you. This sometimes enables lower flight costs as well as more time to visit Morocco's beautiful cities. The stable is located 5 km south of Essaouira near the coast. Depending on your wishes you can spend the night in the hotel or in a camp next to the stable. The proximity to the ocean also enables you to enjoy the pleasure of water sports and beach days.